Sony Theme Creator for Xperia helps you design distinctive themes for Xperia smartphones and tablets, using Adobe Photoshop as an image editor together with the easy-to-use Theme Creator graphical interface. You can create a theme, package it up as an installable APK file, and offer it to users to be installed like any other app. Sony Theme Creator for Xperia helps you design distinctive themes for Xperia smartphones and tablets, using Adobe Photoshop as an image editor together with the easy-to-use Theme Creator graphical interface. Version 1.3.3 is a freeware program which does not have restrictions and it's free so it doesn't cost anything. 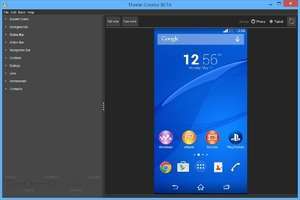 For security reasons, you should also check out the Sony Theme Creator for Xperia download at LO4D.com which includes virus and malware tests. Additional screenshots of this application download may be available, too. Providing editor reviews and free download of mobile phone tools such as those published by popular manufacturers like Motorola, Nokia, Sony Ericsson and Samsung. Access to Apple iPhone tools is also provided. Check out some of the freeware downloads available in the mobile phone tool category. They contain no strings and are available at zero cost. 3 out of 5 based on 65 ratings.